y Monday! 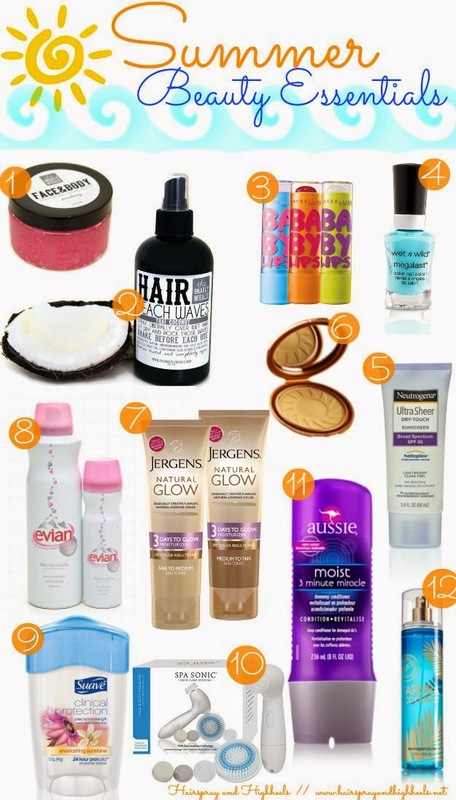 Summer is upon us and I thought I would share with you some of my favorite summer essentials! When the seasons change we sometimes need to add in new products, and change up some of our routine. These are my summer beauty essentials that keep my routine fresh all summer long! 1.- . Gnarly Whale Strawberry Sugar Scrub – Our skin tends to dry out a bit in the summer, just as it does in the winter months so a good thing to have on hand is a good exfoliating scrub! What I love about this one is it’s completely vegan, gentle enough for you body and face since it’s made from sugar, and you can even use it for your lips! 2.- Gnarly Whale Thai Coconut Beach Waves Spray – Your hair is already taking a beating in the summer from that extra sun exposure, so I like to do my best not to add on any extra heat products. An all natural, vegan friendly Beach Waves spray like this one is perfect to use on damp hair and let it air dry for a natural wavy style. 3.- Maybelline Baby Lips – I love a good lip balm in the summer, and it absolutely needs to have SPF and this one is amazing. I love each and every one of them, you can go with the regular or grab one with a slight tint for a little pop of color. These are super moisturizing. 4.- Wet N’ Wild ‘I Need A Refresh Mint’ Nail Polish – This is one my favorite colors for summer! You can rock it as a mani or pedi and it’ll get the job done! 5.-Neutrogena Sheer Touch Sunscreen You absolutely 100% need a good sunscreen! Please, protect your skin! This is one of my favorites because it goes on so light and dries quickly so you aren’t left with that greasy feeling and look. 6.- NYC Bronzer ‘Sunny’ – You definitely need a good bronzer to ‘fake’ that summer glow and ‘sunny’ is one the best shades I have ever tried. It’s my go to bronzer, not just for summer but all year long. It’s a drugstore fave, so you can always count on it being super affordable! 7.- Jergens Natural Glow – I use this as my daily moisturizer in the summer, it’s a gradual self tanner and if you grab it in the lighter of the two shades, it’s just enough to add a subtle summer glow. 8.- Evian Water Facial Mist This is a must have, all summer long! Super cool hydrating mist, helps to keep you cool whenever you need it! I keep this in my purse all the time, a little spritz helps your makeup from running if it starts to get to hot out! 9.-. Suave Clinical Protection Deodorant – I think this is an obvious everyday essential, am I right? I love Suave’s Clinical Protection, it works for up to 8 hours and keeps you super dry. It’s a must have! 10.- Spa Sonic Summer means you’re sweating more, so you absolutely want to have a good facial cleanser, and the Spa Sonic is quickly becoming one of my faves (review to come soon, gals)! 11.- – Aussie 3 Minute MoisturizerThis is the best for keeping your hair moisturized, if you’re suffering from a summer dry spell! Your hair will look and feel instantly better after just the first use! I live and die by this stuff, it’s amazing! 12.- . Bath & Body Works Body Spray ‘Aruba’ This is the perfect summer scent, not to strong and just subtle enough. Something about the scent just screams summer for me.